Famous Russian model Natalia Vodianova admitted that she does not feel in Paris, where she lived for many years,​ like native. According to Vodianova, she is a "perpetual tourist" in the French capital. The beautiful city was not able to win the heart of the Russian model. Apparently, mentally native of Nizhny Novgorod Vodianova is still in Russia, where her true home and where she always comes with great pleasure. But now Vodianova's family lives in France. 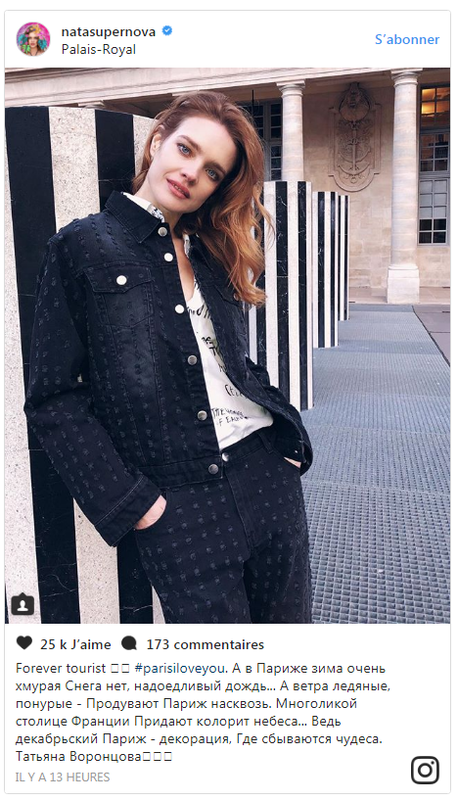 In the photo taken in the capital of France and shared to Instagram Natalia Vodianova looks sad. The picture is ccompanied by Tatyana Vorontsova's verses that tell what the city, in which miracles do come true, really is. "Winter in Paris is very gloomy. There is no snow, annoying rain ... And the winds are icy, dull - They blow Paris through and through. The color of heaven gives to the multifaceted capital of France a special character... After all, December Paris is the scenery, where miracles do come true". Fans asked Vodianova not to be upset, because Christmas and New Year holidays are ahead. We add that recently Vodianova showed her mother . People admired the beauty of women. Many noted that Vodianova is very similar to her mother; and indeed Natalia is in great shape.